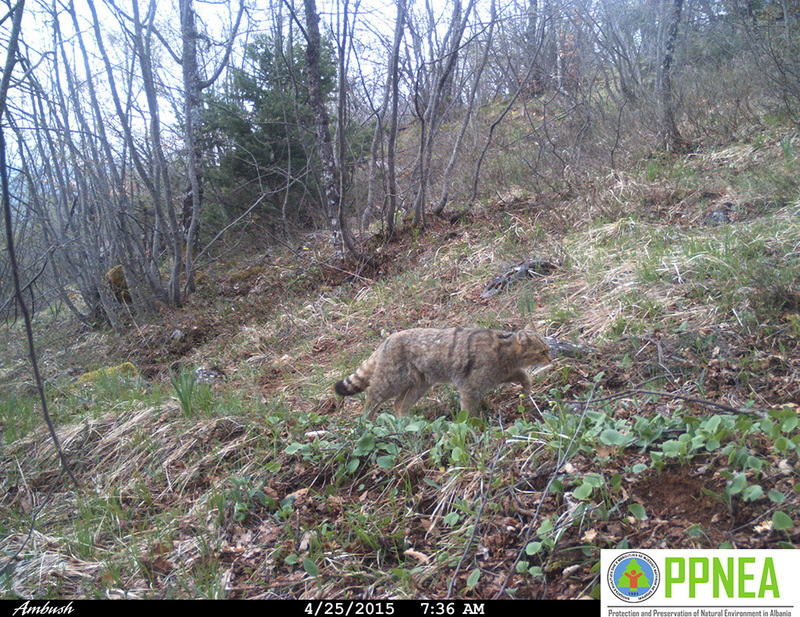 Prespa National Park » Wild Cat (Felis sylvestris) recorded in the Prespa National Park for the first time! (Gorica e Vogel/Korca) A monitoring survey revealed by photographing for the first time the Wild Cats (Felis silvestris) and proofing the evidence of its existence in this park. The Wild Cat was recorded in several cameras, which gives reason to consider that the vital population exists. It will need further research to assess the population size and the distribution pattern. Eleven wildlife cameras have been distributed in the forests and pastures of the Prespa National Park in Albania. The distance between each camera was about 1.5 km. The survey brought good results with a large and diverse number of pictures of wildlife species beside Felis silvestris, such as Martens foina (Marten), Meles meles (Badger), Vulpes vulpes (Fox), Sus scrofa (Wild Boar), Lepus europaeus (Hare), Canis lupus (Wolf) Ursus arctos (Brown Bear), Capreolus capreolus (Roe Deer) etc.. Furthermore, even though no pictures of the Balkan lynx have been recorded up to now, the existence of the lynx pray like roe deer, brown hare, red fox and marten, lead to the assumption that it is only a matter of time until the lynx appears since these animals play an important role in Balkan lynx diet. The presence of Balkan lynx prey serves as an indicator of the return of the Balkan lynx to the area in a near future. The Association for Protection and Preservation of Natural Environment in Albania (PPNEA), in collaboration with the administration of the Park and supported by the Ministry of Environment in Albania and KFW in Germany conducted the extensive monitoring survey with camera-trapping.